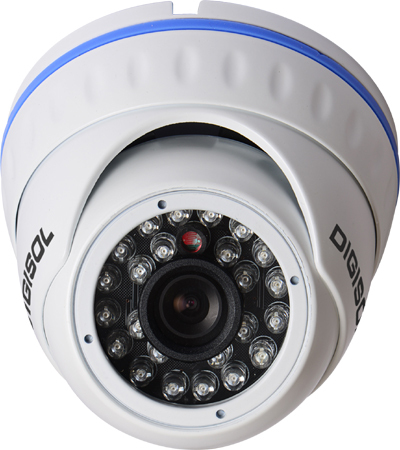 DIGISOL a leading provider of Active Networking products, today announced the launch of its 1.3MP Metal Dome PoE IP Camera with Night Vision. The DG-SC6202 offers the latest compression technology H.264 and a real time image processing hardware. With its high performance H.264 compression, users can stream and store high quality video at low bandwidth and storage capacity requirements. The DG-SC6202 has IR LED for visibility under no light condition, they automatically switch between the Day and Night Modes and ideally suitable for viewing distance upto 20m. DG-SC6202 supports Power over Ethernet, which helps in easy installation by eliminating the need of a dedicated power source for the camera. DG-SC6202 can be accessed from Cloud using the Android or IOS App (Free APP) when connected to Internet. The Dome camera can be integrated with any NVR which complies with ONVIF standard. This camera is specifically designed for indoor applications. The Metal Casing and aesthetic looks of the camera helps to be recessed easily into suspended ceilings or wall mounted with no need for an additional mounting brackets. Price: The feature rich DIGISOL DG-SC6202, is available at street price of Rs. 6300/- and comes with 2 year warranty. May 2017, PNY Technologies, world renowned manufacturing giant for USB and Memory products, is proud to announce its participation in the Grand Computex Taipei 2017. PNY promises to enthrall its visitors with its special selection of upgraded SSD, UFD, Type-C products, and GeForce® Gaming Series to be displayed along with its various products at the exhibition. The Computex 2017 is the largest ICT trade show in Asia and the second largest in the world, the Global ICT show with a complete supply chain, will feature the latest innovative technologies comprising the IoT (Internet of Things) applications available in security, smart home and entertainment, 3D printing, wearables, and automotive electronics. Major International IT Brands participate to showcase their latest gadget and products. The event attracts over 130,000 visitors, including 39,130 international visitors every year. Marking its 37th edition this year 2017, the Computex Taipei Expo will be held in Taipei Nangang Exhibition Hall from 30th May till 3rd June 2017. The Grand event will feature 1600+ exhibitors participating in the world’s second largest computer exhibition with over 5000+ booth for visitors to interact and enjoy the exciting and creative displays. PNY Technologies considered one of the worldwide leaders in consumer electronics market and flash memory products, has launched one of the smallest, pocket-sized design SSD product to enter the global tech market, the ELITE Portable Solid State Drive (SSD). The ELITE Portable SSD drive is faster, more reliable and much more efficient than normal hard drives (HDD) available in the market. It transfers and stores large files quickly with incredible read speeds up to 430MB/s and write speeds up to 400MB/s, so you can boot up almost instantly, reduce load times, and accelerate demanding applications with ease. Get more out of your computer by boosting nearly every aspect of performance. Users can push the boundaries of their storage needs and ensure that they have more than enough space to store their video, photos and files. The ELITE Portable SSD is manufactured in high-quality and smooth aluminum housing. It is more durable than a hard drive and contains no small moving parts that are prone to failure delivering long-lasting performance and product satisfaction. With 2.36” x 1.4” x 0.35” dimensions, the ELITE Portable is one of the smallest and most compact SSD released on the global market compared to other portable SSD and external hard drive solutions. It is powered with latest TLC flash technology and is backed with USB 3.0 specifications. The drive is also backwards compatible with USB 2.0 ports, so you can use it with any laptop or desktop model. The ELITE Portable is small in size but big and fast in its performance, it can store large memory files including movies, music, high-resolution images, software and applications within its generous 480GB storage space, and incredibly easy to take one’s data anywhere on the go. Boot up and backup individual files or folders in seconds and fly through the most demanding applications with Acronis Data Backup software. The ELITE Portable SSD supports all versions of Windows and Mac PCs and delivers endurance, reliability and energy efficiency and 3 years of limited warranty. The ELITE Portable SSD is available in 240GB and 480GB storage capacities and is equipped to store all your programs and media files.